WinCustomize: Explore : ObjectDock : T.O.A.D. I use TOAD (Tool for Oracle Application Developers by Quest software) everyday at work and couldn't find any frog icons out there. This image is originally from the splash screen of TOAD, I took a screen shot and tweaked it a little bit. Thanks for another person keeping an eye out for the developers here who like eye candy!!!! 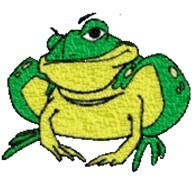 I love it, RIBBIT!! Thanks Rael, nice to meet a developer!